My boys love to play pick up basketball games. When Fred's son comes over, they get the life size hoop out in the driveway and all 3 boys are shooting the basketball. Both of my boys played when they were in elementary school. Neither of my boys have had a hoop on the back of my door since they were little and we lived in our old house back in Minnesota. 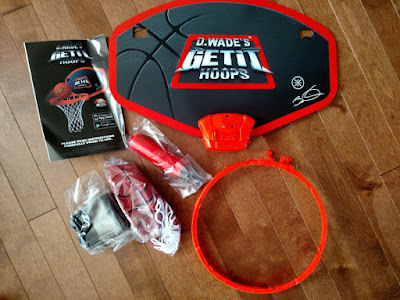 When I was contacted to do a review & giveaway of this D. Wade's Get It Hoops, I was pretty excited for my son. What kid doesn't like to have one of these on their door as they're growing up. They're about as American as apple pie. 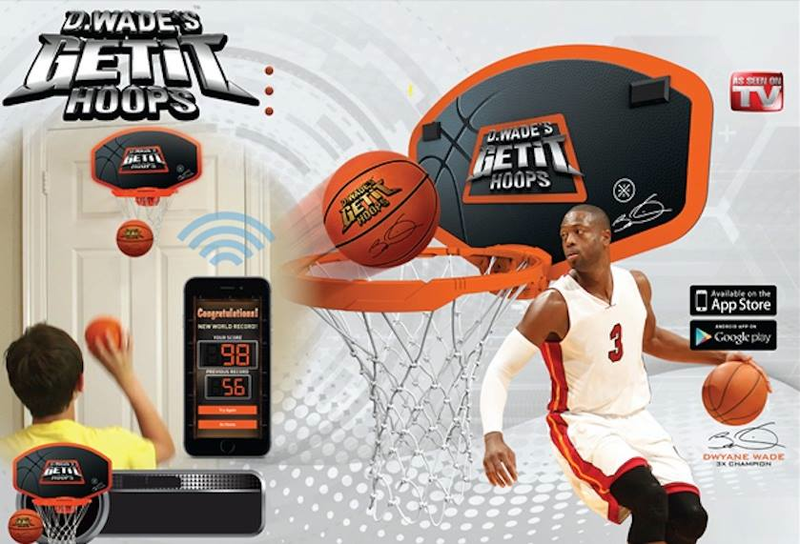 What's great about this hoop is it pairs with an app! 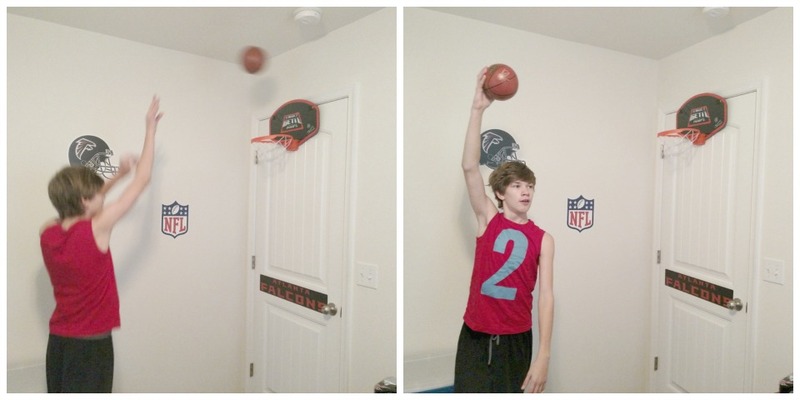 Your kids can use the app to keep track of the baskets they make and take videos of themselves showing the world their "skills". Then they can share those videos with others who are on the app. Putting the Hoop together and blowing up the ball were really simple. We have it on the back of my son's bedroom door, but I think we'll probably move it to the closet door so he doesn't hit our smoke detector. It takes 3 AAA batteries, and since we only have 1 hoop, we have it on the A setting. The rim has a sensor that keeps track of the ball as it go through the hoop. When you have the app on, it keeps track of the baskets your child makes as well. I think one of the fun ways to use the app is if your child has a friend over, they can play against each other. Someone keeps track of the app as both kids play. As each basket is made, the person keeping track chooses who made the point! We both thought that was pretty awesome! I would give this to my son. He loves playing basketball! I'd like this for my 17 yoa son. He'd have fun with it. Thanks. My Granddaughter wants one of these, she loves to play but the reg hoop is just too tall for her right now. my friend's son LOVES anything to do with balls! I'd give it to my cousin. I would give this to my son, he would love it!! I would give it to my eight year old son. I would like to play a little one on one with our grandson. This would be for my son's bedroom - he would love it. My kids would love this. I predict they would challenge my husband. I would give the hoop to my grandson. My 9 year old so for Christmas. I would love to give this to my son! 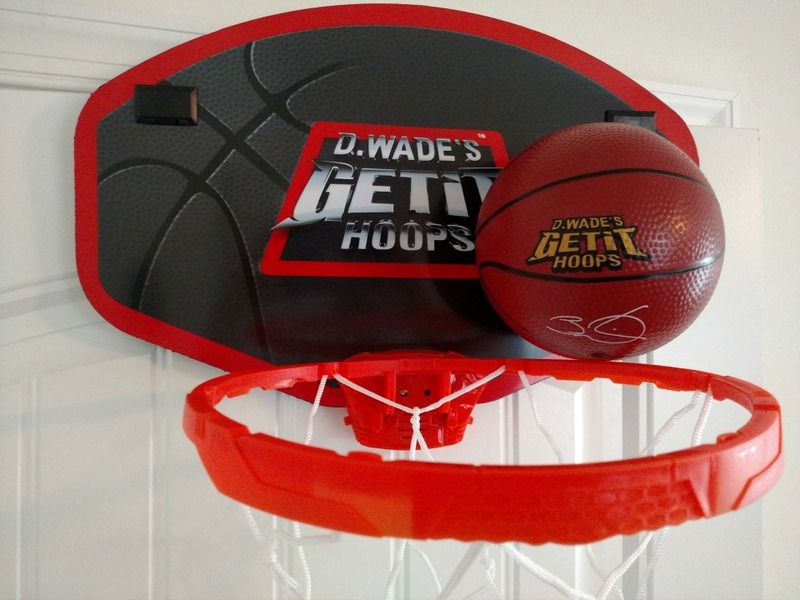 He is a huge basketball and Duane Wade fan, so this would be perfect for him! He would be thrilled! I would give this to my daughter. She would really love to have this. She loves basketball. My oldest daughter who is 7 would love this! I would give this to my youngest grandson. My grandchildren would love these hoops. This would be a unique gift for my grandchildren. my grandchildren like toys with a connection to their smart phones. What a neat idea with the app and hoop for my nieces nephews. My children like cool apps and hoops. A fun game with this hoop would be just right for my nieces and nephews.